While Microsoft support for Windows 7 in its various forms/versions continues, availability of new Windows 7 computers and upgrades (home to premium) is quickly evaporating. Over the past few weeks we have seen inventories of Windows 7 based PCs slide into back order status. Sometimes this means more units are on the way, but with Microsoft making a huge marketing and sales push to get Windows 8 out, those back orders may go unfilled. In addition, while the “Anytime Upgrade” to Windows 7 Pro option still exists online from Microsoft for Windows 7, keep in mind, there are limitations to what versions are upgradable, and you cannot upgrade from 32-bit to 64-bit architectures. The PCs that are currently available with Windows 7 are largely Windows 8 platforms which have been “downgraded” by the hardware manufacturer (HP, Dell, IBM, etc.) The good news with this; upgrading these PCs from Windows 7 to version 8 later on will be much easier. Keep in mind, this downgrade process expense is passed through in pricing, meaning Windows 7 machines will likely be more expensive than Windows 8. Additionally, those manufacturers can choose to stop downgrading new PCs whenever they deem it unprofitable. The most important consideration for businesses is to avoid being caught in between versions. Either purchase replacement PCs which have been downgraded now, or get on the phone to your software providers and let them know that you will be converting to Windows 8 sooner rather than later, and they need to test their software on the same schedule. Ultimately, if you are looking to add a Windows 7 machine, now is your time to make sure that you are able to do so. 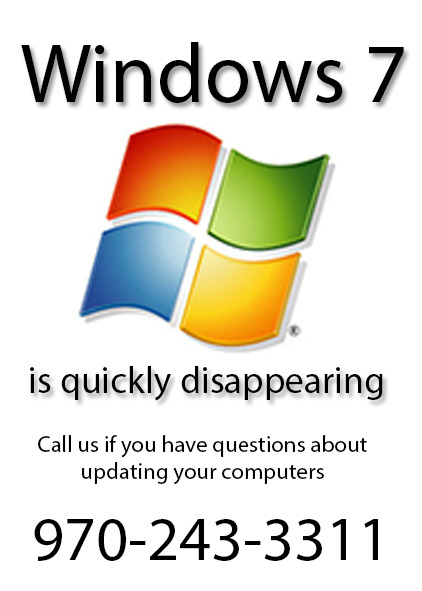 We have limited quantities of Windows 7 machines at this time. Once these supplies are depleted, Windows 8 will be our only option for new PC’s.